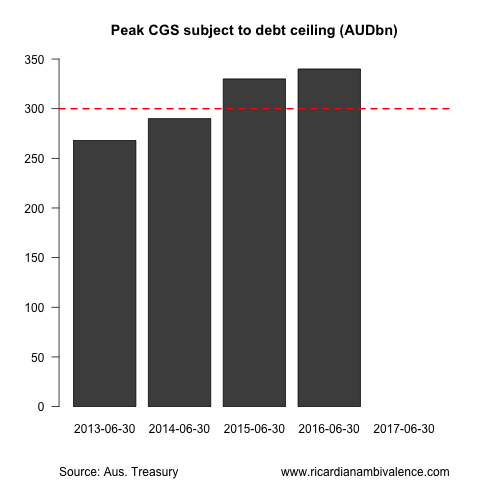 There was a bit of confusion about the path of debt subject to the legislative ceiling of AUD300bn following the publication of the 2013-14 budget. This has now been settled, with the Australian Treasury supplying the facts to Senate Estimates: on budget numbers, debt subject to the AUD300bn limit is expected to first exceed the legislative cap in the 2014-15 financial year, and will hit ~340bn in 2015-16. In the above chart I’ve used financial years on the x-axis, however the tabled documents show the dates of the peaks (May’13 in 2012-13, Jun’14 in 2013-14, Apr-15 in 2014-15, and Dec-15 in 2015-16). The documents also show year ended CGS subject to the limit — which extends for an additional year. Apparently the daily cash sheet has not been made for 2016-17, so they cannot figure the peak as they do not know the likely timing of their borrowing. 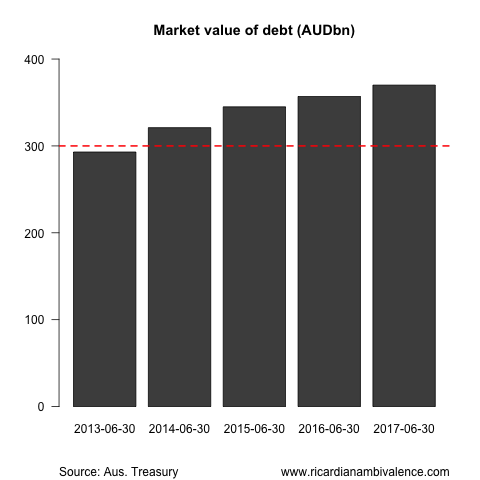 In any case, the bottom line is the debt subject to the limit rises by a further AUD10bn to AUD330bn in FY16-17. That may seem confusing as there’s a surplus booked for 2015-16 and 2016-17, however it’s due to the fact that borrowing to fund the NBN and Clean Energy Finance Corporation has been moved ‘below the line’ (it is oddly treated as a ‘financial investment’ that is valued at whatever is paid for it — which holds down ‘net debt’ but is a good way to guarantee waste). This is mostly a political issue. The concept of debt subject to the limit is mostly beside the point. The correct measure of debt is market value, as that’s the ‘replacement cost’ of borrowing. This measure was available in the budget, and is shown below. To understand why the debt ceiling measure (face of nominals and base-face of linkers) is flawed, you need to understand a bit of bond mathematics. Say a government borrows $100 in perpetuity at 10% interest rate ($10/yr cash cost). Now suppose that the market interest rate falls, such that on the same terms (except the rate) finance is available at a 5% rate. Now the Government could borrow $200 for a $10/yr cash flow cost. Because the market sets the interest rate, if a Government continues to borrow on the old high interest rate terms, they will take in more cash up front (but pay more interest later on). It was basically this that confused the translation from the market value numbers (which we all knew from the 2013-14 budget) to the debt ceiling numbers. There was room for disagreement about how many high coupon bonds and linkers would be issued (as it’s only face that counts). I have believed the sub $300bn estimates. It always seemed unlikely that the AOFM would issue enough high coupon bonds and linkers to stay under the limit … and anyhow, why would they? It’s better for taxpayers to issue low coupon debt and hand the interest rate risk to the private sector. Which raises the question: if you budget to exceed the bedt limit, shouldn’t you make plans to raise it? This entry was posted in AUD, Australian Politics, economics and tagged debt. Bookmark the permalink. While I agree with your broad point about the whole debt ceiling, the jibe at the NBN devalues your argument. While you might be able to point to little examples of waste and mismanagement the huge benefits that flow from this project and investment are enormous. What is a shame though is that many economists seem to ignore these benefits, my question is why? And before the whole it could have been done cheaper argument is rolled out, lets look at the ridiculous alternative (turnballs fibre to the node) and be honest about whether or not this is really a better option. +1 — I want NBN now! That is the future and that is the type of infrastructure we need. When I travel to Europe, they are years ahead of us on Internet speed. 1/ i am a major internet user, so it’s a subsidy to me. i think all of you are in the same boat. let’s be careful of bias. 2/ what could we sell the NBN for just now? input cost? really? most of the cost benefit stuff that justifies the NBN amounts to claims about spillovers and non-monetary benefits. they may well all be true (and more), but if they are then we should be discounting the value of this ‘financial’ investment. 3/ it’s fairly well established that valuing anything at input cost leads to cost maximisation. I think the money invested in NBN is easily made back, and more, in the next 10 years. It’s like the modern concept of a motorway, a bridge, and you can even charge for it. I am not arguing on the accounting part, just that we need NBN as a nation and it’s finally good and productive govt investment. And let’s do it properly, not half-baked solutions that will cost us more later. Let’s remove negative gearing concessions (the ability to deduct investment losses vs other incomes) which only support speculative investments in unproductive assets and inflate house prices, and use that saving to finance the NBN! Isn’t the NBN projected to cost A$37.4 billion over a 10-year ? 1/ the benefits don’t just flow from internet use. One example is the work NBN co. have been doing on sorting out geographic data i.e. aligning ALL residential mapping data to one coherent data set. This will have massive implications for data linkage projects and will improve the quality of data available for analysis. Thus improve policy development and benefit everyone. This is just one example of incidental benefit…there are many. 2/ why would we sell it? the private sector aren’t interested until they can make quick and easy money. It is a very good example of what governments should invest in, that is we should all be comfortable with the fact that it is a very good investment of tax payers dollars. plus there doesn’t appear to be any systemic mismanagement in its implementation (putting the liberal propaganda to one side) so why the fuss about cost? 3/ again the cost is stupidly outweighed by the enormous benefits. This infrastructure will be around until I’m dead and buried and represents the backbone of future productivity growth so any cost maximisation will be dwarfed by the value it will bring. The arguments against the NBN remind me of the same type of arguments against the GST. Both went away once people realised how awesome the benefits were. But I agree with the central premise of the piece you wrote…debt ceiling arguments are inherently political and stupid. Ricardo you are kidding mev aren’t you. Selling a monoploy wouldn’t get you much? you really do need to do some corporate finance! Not that we ever should sell it mind you. The ACCC won’t agree to the commitments, and it’s going to be old tech soon, so it will almost certainly be a financial loser. old tech…i don’t think so. When do you see another govt investing in a project of this scale again anytime soon…Copper is old tech but it still isn’t redundant…the libs policy is dependant on copper. So fibre is going to be around for a very long time, enough time to make the outlay costs look like pocket change when looking at the benefits. Yes, I agree. There’s always going to be newer / better technology, but that does not mean we should not invest in anything just because something better is coming next. We had the biggest mining boom ever, and we have the greatest economy in the world, isn’t it time govt actually invest in something useful for the future? make that me and monopoly please. RA both Stepen King and Joshua Gans( two blokes by the way I have a lot of respect for) have been badly burned because they made similar silly comments re-technology. Looks like I (unfortunately) got to this fight late. FWIW, I agree with Ricardo that the NBN is likely to be a negative NPV project (both economically and financially). Interesting that most people – both commenters here as well as most journos and the general public – have such rose-coloured glasses about it. Let’s assume that at least half the cost (and probably more) is attributable to going from the Coalition version to the Government’s version. And let’s also remember that even now, capital city CBDs and most schools, hospitals and universities as well as major suburban shopping centres or commercial centres (like Parramatta, Camberwell, etc) are already wired with fibre or would be under the Coalition’s plan. Then we need to allow for the fact that even under the Coalition’s policy, most households will get 50+ Mbps, which will be enough for any presently-used purpose. So what the supporters are saying is that the doubling of the cost is justified by giving the average suburbanite 1Gbps instead of 50 Mbps, plus faster uploads of course. And we are told that the benefits are simply enormous, so enormous that the government refrained from doing a cost-benefit analysis. The supporters say that would be churlish, citing the IBM example, QED. But they fail to understand that CBA is as much about making one’s assumptions explicit as it is about getting an accurate answer. If the benefits are so great, let’s see where the advocates think they will come from. As it is, only a small proportion of households are willing to pay extra for the faster speeds available from cable broadband. Such a revealed preference is the first place an economist should look to see if there is any potential demand for higher speeds in the short to medium term. And Ricardo is right that discounting is important. Using a conservative cost of capital of 10% real (super-safe electricity network businesses with guaranteed cost recovery get only a bit less than that), the value of a dollar of future benefits halves in 7 years. So even doing NBN-lite now (or nothing at all) and doing the full rollout a decade later when more is known about the potential applications and the scope for Nth-generation wireless could pay huge dividends. For those supporters who say the project has been managed ok to date, my response is that the project has barely commenced. Name an Australian infrastructure project of similar scale that has finished on time and on budget. The final point is that all the above assumes a government acting rationally in good faith. Any economically-rational central planner would start such a project in the inner cities of Sydney and Melbourne and work outwards, due to both cost (economies of scale in more densely-packed areas) and likely benefits. Starting it in places like Kiama Downs , the NT and suburban Townsville, etc makes no sense except on political grounds. I think you are being a bit short-sighted here IMO. Truth is that we are being left behind compared to the rest of the world and our internet connections are simply awful. Copper is not good and houses are often too far from exchanges anyway Copper to the house is rubbish. There’s very few locations where you can reach the full ADSL speed. Uploads speeds are key too. Doing nothing for 10 years? That would be a disaster. We are talking about 40bn here over 10 years, 4 per year. Peanuts compared to the benefits it delivers. I am sure govt can save that money just by cutting other expenses and concessions, like negative gearing, maternity leave at full salary! (joke of the century). I personally would invest my money in such a project, given the opportunity, maybe they should create fiber-bonds! Or list the NBN on the share market. I know that if we create such a project, in 10 years every one will be on fiber and fiber will be cheaper than current over expensive ADSL. I do agree that the plan should focus on most populated areas first, where you have most users. * ISPs stopped investing in ADSL a while ago when the NBN was touted, as it would strand their investments. Lots of current complaints about broadband are due to people moving house and being unable to get a slot due to lack of such investment. * If ADSL speeds are so bad and that is so important, why do so few get cable broadband? * NBN isn’t required to earn a commercial return, but even the business plan makes heroic assumptions about things like the proportion of wireless-only households. * Any project can be profitable if the government abolishes alternatives (ie decommissioning copper) so consumers have less choice. The public policy question is whether the project is likely to be net beneficial from society’s perspective. * Why keep investing in old technology? Makes no sense. * Facebook did not exist 10 years ago. * It could, but it’s the same as building a motorway or a bridge. * It’s going to be absolutely net beneficial from society’s perspective, in 10 years you will be asking yourself how we would do without it. I thought we wanted to become a “high-tech” manufacturing country? BTW, try to navigate the web today with a 56k modem that was standard 10 / 15 years ago….. I would add that although I’m no telco expert, I do know a lot about the Victorian electricity smart meter rollout. That project initially had a fairly detailed CBA done by the (evangelical) regulator (the ESCV) and even then it’s turned out to be a dog, partly as a result of an evangelically-favourable CBA, partly as a result of inadequate allowance for the full implementation costs of the rollout and partly as a result of an unanticipated decline in peak demand. Of course, at the time, the ESCV and the Victorian government thought it was a no-brainer and even the ACCC thought so too (Alan Fels was a big fan and initially thought smart meters should be a prerequisite for allowing electricity retail competition), but even in the boring and technologically-stagnant world of electricity infrastructure, central planners got it wrong. By comparison, the NBN has no hope of being net beneficial. Will politifact re-evaluate it earlier ruling? I bet they do not! On Gross debt you have not mentioned Basel11 guidelines. That is the major reason for this potential problem. joe has no idea about it. on the NBN, can I advie all people to go to Core economics and read the comments when both Setphen King and Joshua Gans bring up the NBN. They both get slaughtered by the engineers! The NBN is likely to be a monumental waste of money — it will never make it on commercial terms. Also it’s highly regressive. those who will use it are already relatively rich (i’d be willing to guess everyone who reads this blog), and those who will not are in greater need. The government may be able to tax it into profit by exempting it from normal competition law, but that’s not a commercial success — it’s just a tax and spend policy. Joe’s wife is ex-DB FICC, and his chief of staff used to head UBS FICC — so i’m 99.9% sure you’re wrong about joe’s knowledge of Basel III, and the asset requirements that arise due to the LCR test. Which just makes it even more disappointing to me on a number of levels that Joe supports quotas for women on boards. Another reason to have NBN: we have become a high-cost economy and are losing competitiveness, why would companies invest in Australia today, outside mining, with our inflated salaries? NBN could be that very reason. Being one of the countries with the best Internet bandwidth in the world could be that differential. We could be ahead of the pack for many years. Stop supporting the car industry and support NBN instead. The NBN should be a public good. It shouldn’t be about making money but ensuring all ISPs offer a decent internet service. Health and education would clean up under this! Joe has never come close to saying Basel 3 is a large part of why gross debt wil lgrow a lot faster than net debt! Agree, the NBN is a public good! Heres a question for anti-NBNers, if the government doesn’t invest in large public works like this then who does? Its clear the private sector was never going to do this. So should we have just waited around forever? This is government bread and butter. Think what australia would be like if governments didn’t invest in our first class interstate road system and it was left to private companies to link our major cities. I have a hunch…potholed riddled highways that cost an arm and a leg to travel on. Its works like these that benefit the whole of society, just because all the benefits can’t be tallied on an accounting sheet doesn’t mean they aren’t real. History will judge the doubters and show how wrong they were…thats if Tony and Malcom decide to drop there ridiculous alternative and just finish what has been started. sure, it’s wonderful: i use the internet more than anyone i know so all those taxes (explicit and implicit) are going to subsidise my consumption. I love it — but it doesn’t make it right. In any case, this is about how to value the ‘financial investment’ — is cost price okay? If it’s got all these spillover benefits and that’s why we are doing it, then the answer is a clear NO. You must not value it at cost: you cannot capture spillovers, so they must not be included in the accounting value of the asset / investment. Yeah I agree if it was just about subsiding consumption then it isn’t right, but thats a very dishonest argument. Its about so so much more than that and you probably realise that given your second point about accounting for spillover benefits. So you either agree there will be spillover benefits thus negating your first argument about it simply being a subsidy for consumption, or, you think there will be no spill over benefits. Or, you think the spill over benefits are exaggerated and really amount to nothing, which is basically the same as my previous point. Your point about how to value a financial investment is sort of obscure to me. Yeah the value should probably not be cost but calculating the true value by including spillovers is almost impossible. There is no way of knowing exactly how (to the dollar) the NBN will improve productivity, change business and generate wealth. So why make a dodgy figure up just for the purpose of accounting? If governments simply made decisions based on whether or not something balanced in accounting terms we would still be driving horse buggies and communicating by pigeon courier. Not all things can have a number put to them, its a concept many accountants and economists dismiss too readily. my point is not about IF the NBN is worth it … it is that it is certainly not commercial and so valuing it at cost is an accounting fiction. Unlike some other countries, Australia doesn’t have a tradition of private investment in infrastructure. But even in the post-privatisation era, we have seen considerable private investment in mobile telephony and gas pipelines, not to mention ports, airports and roads. Telstra was looking at building FTTN in about 2005, but couldn’t make a deal with the ACCC. No reason why a Telstra couldn’t build a full NBN when it saw prospective demand and could do a deal with the regulator. But even if you insist that government must be the foundation investor, why not at least seek to make your assumptions about massive public benefits explicit – ie quantify the benefits you expect from different sources? NBN seems to be one of those totemic things, like the car industry used to be, that makes otherwise sane people go ga-ga and lose interest in applying the same standards of public policy-making as they would to any other government attempt to pick winners. If you think I’m being unfair or petty, how’s this for a test: let’s say Turnbull is right and the real cost of the NBN is $90+ bn instead of $37 bn. Would that change your mind about whether it was a good project? What if it was actually $300 bn, would that make you think again? The problem is that once you abandon evidence, you don’t have any reasonable criteria for judging when its time to change your mind. What evidence Rajat. Its clear from just about every telecommunications expert that the NBN is the right way to go. Just because economists don’t have the ability to accurately forecast or calculate the true value of pieces of infrastructure or services doesn’t mean it shouldn’t be built. That is just another failing of economists and economics…(just one of many). If you can’t see the NBN will have wide ranging benefits and that some of these benefits are not apparent to us now then there really is no point arguing this with you. But remember this in 20 years time and ask yourself if the NBN was worth it. That’s exactly backwards. Economics provides a framework for valuing benefits (and costs). It’s not the job of economists to conjure up potential new sources of benefits. It’s the job of the self-professed ‘telecommunications experts’ to tell us where the benefits will come from and how and why they are attributable to extra speed for the suburbanites. So far, all we’ve had is hand-waving from the boosters. And that’s because voters have been too caught up in the hype to force the government to make a prima facie case. It’s not that I don’t believe there will be any benefits, it’s that the onus should be on those intending to spend $40bn of taxpayers’ money on providing some credible analysis other than “it’s the vibe”. I should clarify it’s backwards because instead of putting any thought into where benefits might come from, the putative experts seek to do the job of economists, which is to tell policy-makers whether the NBN is a good project. They’re all completely sure about that, but can’t really explain why. Sorry but the greatest things are made, and started, as the result of ‘gut feelings’, because they feel right, they feel good. If two economists were in a garage trying to design the first search engine or the first social network, they would still be there, discussing costs and benefits. Previously I worked for a company who wanted a detailed business plan for every new product and guess what? It was never fully quantifiable, we never released a new product, we were always still discussing, analyzing, quantifying…. The greatest products, and companies, are made by someone at the top that just knows what is “right” to do. And even if the NBN is not going be a 100% success, you can’t succeed if you do not try at least. It’s hardly going to bankrupt us, is it? I am surprised that with all the govt wasting that we have, for once a good, visionary project comes along and you are so critical of it. I guess you prefer spending our tax money on negative gearing, car subsidies, family benefits A, B, C, D and E, baby bonus, FHB bonus, and various superannuation concessions. but this is the genius of the capitalist system — let the private sector take the risks. lots of different risks. and then when you get it right you get the massive payoff. government picking winners has a long and famous track record of stuffing even very good ideas up. If this is so wonderful, and regulation means the private sector cannot do it, then how about we talk about changes to the regulation? if the legislative protections from competition law happen, the NBN will be a bigger nastier Telstra — and the history of protected monopolies is that they are inflexible and slow to innovate. … but all of this is a long way from my point — if it is only a good idea because of the spillovers then it should not be valued at input cost. it should be discounted. i think we all basically agree that if it’s worth it, it’s not as a narrow financial investment in the sense a private business would make the investment? if so, then we agree it’s not a financial asset to be valued at input cost. Private NBN would be great IMO, but the problem in Australia is that our continent is very big and our cities are very much spread out and I am not sure we would be able to find a a private doing NBN without public support. The return on investment would be not so good, probably a loss for many years…. but that does that mean we can’t have NBN in this country. We are lucky to have so much land which give is so many minerals and so many benefits, let’s use some that money we are making to support the NBN. don’t you believe in the future? Exactly! :) Let’s make hover-boards instead of the NBN. But don’t say too loudly or Joe Hockey will take it seriously and propose a new alternative NBN plan where we can use hover-boards to transport data to the premises instead of fiber! read the Optus ACCC submission? that’s NOT supportive of the framework at all. Mark and ricardo wrong on Politifact! huh? my data is from the Cth treasury. not really – Politifact has kept as mostly false Hockey’s earlier claim based on the budget papers (even though the debt position can be triangulated from them). They are saying the same claim based on later Tsy information is true. Go figure. You can only hold the first position if you are basically ignorant of bond math. Forget hover-boards, cold fusion was within our grasp – if only Barry Jones was still around!